Manage Your Card Online: 24/7 access can help you stay on your budget. No Overdraft Fees: You can’t spend more than your balance. Sign Up for Text* and Email Alerts: Get your card balance conveniently. Direct Deposit: Fast, easy and FREE. Enroll in direct deposit. Easily Reloadable: Several ways to add funds to your card. Learn More about the Personalized Card Rewards and Benefits. Get all the rewards and benefits with simple pricing and no hidden fees! For further information about how these fees are applied, please see the Cardholder Agreement or Fees and Limits schedule. 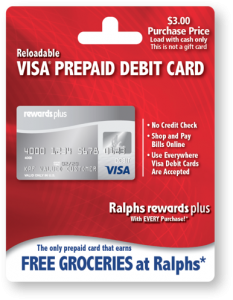 Purchase a temporary card at a register at any Ralphs location. Load between $10 and $500 cash onto your card. Activate your card online and log in to check your balance. Register for a Personalized reloadable card to earn rewards. Get A Card. ** There is no credit check! Just verify some personal information on your application. Terms & Conditions apply. See Cardholder Agreement. Activate. After successful identity verification, your card will arrive in the mail and will be ready to use immediately after activation. Get Rewards.† Earn points towards free groceries. 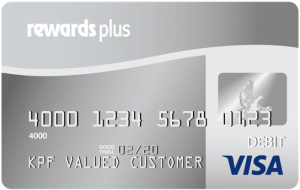 Earn points faster the more you use your card. ** Successful identity verification required. *** The Temporary Card cannot be reloaded and has no cash access. For use in the U.S. only. These restricted features are available when you convert to a Personalized card.